The all-white room. Super pretty, super clean and calming…can be super difficult to accomplish. Today we’re going to help you figure out how to achieve this look in your own home. The three rooms below are great examples of how to take an all-white room into the sentimental/romantic direction. Tufted upholstery with soft corners, large-scale light fixtures and white toned throws and pillows. The key to a great romantic room is to pick shades of white that have a warm undertone…and be sure to use multiple shades for layers of interest. Natural wood and glass side tables work well for romantic rooms. A modern room is a natural fit for an all-white palette. Clean-lined upholstery with low profile arms and backs, plus interesting shaped lounge chairs and black accents make up a modern white room. This is a cooler look, so the white tones you choose for this look can have cool undertones. Accent pieces should have a smooth finish – minimalism is prevalent in modern rooms. Linen white slipcovered upholstery pieces, symmetrical artwork, lots of cozy pillows make a classic all-white room work. Stick with warm tones of white with this look as well, undertones of red and yellow will make these rooms feel comforting. Black is a nice accent color in classic all-white rooms, along with rustic wood accents. 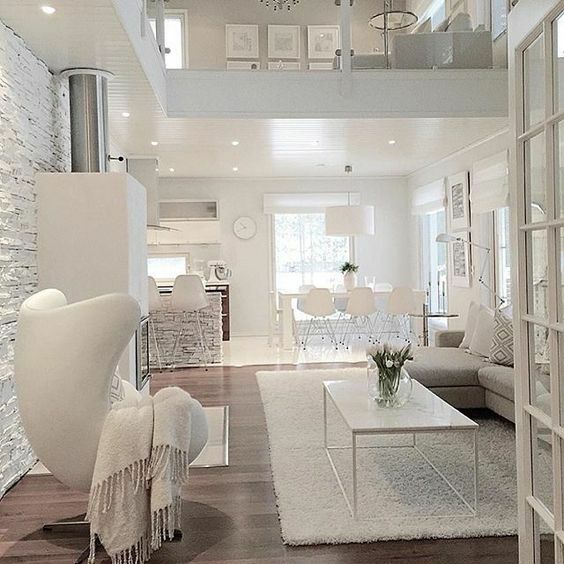 We’d love to see your take on an all-white room! Tag us in your room on Instagram @bydesigndm. Or, we’d love to help you create one. Stop by to visit with us in person – or check out our designer blogs to see some of their work. Top 5 Design Trends of 2019?